Over several centuries, Greek thinking displaced the Hebrew foundations of Jesus' message, creating a religion far removed from what He intended. What were the practices of the Apostle Paul and the first Christian church? Reexamining the roots of Christianity has become a major endeavor among New Testament scholars. In an attempt to better understand and relate to Judaism in the wake of the Holocaust/Shoah, their studies have yielded some surprising admissions and necessary corrections to the way Jesus of Nazareth, Paul of Tarsus and the early Church are regarded. A general conclusion is that first-century Christianity was far more Jewish or Hebraic in its beliefs and practices than has been accepted for almost 2,000 years. One scholar who has pondered the implications of these rediscovered roots is John Garr, president of Restoration Foundation, which specializes in making known the Hebrew heritage of what came to be called Christianity. Vision publisher David Hulme interviewed him for the television program, Quest for the Real Paul. DH You have written: “In the middle of the second century, the Hebrew foundations of Christian faith were attacked by the first great heresy that challenged the church.” You also note that “some of the ideas of this heresy so permeated the church’s corporate psyche that it has not yet fully recovered its spiritual and scriptural equilibrium.” What was the heresy and what has been its specific effect? JG The heresy was called Marcionism after Marcion, a very wealthy man who was strongly influenced by Hellenic culture, the ideas of Plato, and much of Gnosticism. Marcion wanted to separate Christianity from any connection with Judaism and the law. He said that the Old Testament was a record of a failed religion that should be destroyed, and actually had been destroyed by Jesus Himself. He even went so far as to rewrite Matthew 5:17, where Jesus said in the Sermon on the Mount, “Think not that I have come to destroy the Law or the Prophets: I have not come to destroy them but to fulfill them.” Marcion turned it around and said that Jesus’ actual words were “Think not that I have come to fulfill the Law or the Prophets: I have not come to fulfill them but to destroy them.” Further, he took some of Paul’s epistles and some sections of the book of Luke and edited them to eliminate any connection with Judaism or the Old Testament. As a result of his actions, church leaders finally branded him a heretic and excommunicated him. With this background one would think Marcion would have faded into history, but the residue of his influence has continued to permeate the Christian church even to the present time. It is probably best characterized as antinomianism—the position of being against the law—which is very much a part of many denominations. Many antinomians would say that they are preaching the gospel of the grace of God, and that grace and law are violently opposed to each other and cannot exist in one another’s presence. So the idea that the law has been completely abrogated, that the Old Testament is no more of any effect, that Jesus came to destroy the law, and that believers today are only under the grace of God, is fundamentally neo-Marcionism. DH What is your view of the idea that Paul was not a Christian because there were no Christians in his time? JG There were no Christians in Paul’s time by our modern definition. Obviously Jesus Himself was not a Christian, because the word did not even exist in His time. The idea for the term Christian was to identify those who were the followers of “the Christ”—or, as it had come into the Greek language, Christos. They could easily have been called Messianics or Messians to identify that they were followers of Jesus the Messiah. Vision publisher David Hulme interviewed several scholars for his television program about the apostle Paul. On one question they were all in agreement. Paul never considered himself to be a Christian within the framework of how we define the term in our time. He would have identified himself as a Christian only in the context that he was a disciple of the Jewish Jesus, whom he understood to be the Messiah or Christ. He was altogether a part of the Jewish community of his day. Interestingly enough, there was no such thing as a monolithic Judaism in the time of Jesus or Paul. There were many Judaisms, and the earliest Christian movement was simply one of them. There was Herodian Judaism, Essene Judaism, Pharisaic Judaism, Sadducean Judaism, and so on. I believe James Charlesworth has identified perhaps as many as 150 different sects of Judaism existing in the first century. So, early on, Christianity was not recognized as being Christianity at all; it was simply one of the many sects of Second-Temple Judaism. As a matter of fact, Paul mentioned this when he wrote, “According to the Way which they call a sect, so I worship the God of my fathers, believing all things which are written in the Law and in the Prophets [in the Torah and the Neviim]” (Acts 24:14). Paul was simply saying that he was worshipping God—the God of his fathers—in a manner that others within the Jewish community would have identified as one of the sects of Judaism. DH The suffix -ian signified belonging to a particular party or group, didn’t it? JG Yes, and not only that, but originally the word Christian was a negative term, a caricature, just as the term Jew was when it was first used. The people who were of the tribe of Judah were called Jews, a contracted form of Judah, in what was essentially a racial slur. The same is true of the original use of the term Christian, when believers in Jesus were first called Christians at Antioch. Initially it was a negative term applied by those outside the church; however, it was eventually accepted by the believing community, just as the negative term Jew had been adopted by the Jewish community as a means of self-identity. DHPaul refers to his belief system as “the Way”—that people became followers of the Way. What is the background of this term? DH Could you comment on the idea that Paul, not Jesus, was really the founder of what we know as Christianity? JG Paul simply continued on in the heritage that he had learned from his fathers. He wasn’t trying to break off and start a new religion. I would say that, likely until his dying day, he considered himself a Pharisee, because his views were more closely aligned with the Pharisaic party than they were with any other party within Judaism. In Acts 23:6 he confessed, “I am [not “I was”] a Pharisee.” He even declared in Philippians 3:6 that concerning the Torah, the Law, he was blameless, which is a pretty profound statement. DH In the early 20th century, the German theologian Adolf von Harnack remarked that “it was Paul who delivered the Christian religion from Judaism. . . . It was he who confidently regarded the Gospel as a new force abolishing the religion of the law.” This sounds a lot like Marcion. JG It’s very interesting that you would say this. Von Harnack’s thinking in this regard was really a pure form of neo-Marcionism. He went so far as to say that if the church had had the courage to do so, it would have recognized that Marcion was right, that Judaism had been abolished and the law destroyed. He was very adamant about that view. As a matter of fact, von Harnack would have agreed wholeheartedly with Julius Wellhausen, who said that Paul was “the great pathologist of Judaism.” This entire school of thought believed that Jesus destroyed Judaism and Paul entombed it. This thinking was based in the prejudices against Judaism in the Germanic school, with its strong, overt anti-Judaism as well as the incipient anti-Semitism that eventually became fully manifest in the Holocaust of the 20th century. The idea that somehow Paul was the one who revealed that Judaism was a failed and lifeless religion that needed nothing more than a sarcophagus in which to entomb it is totally opposed to everything that Paul viewed and represented about himself and his faith. DH A leading news magazine recently made this statement: “For centuries, many Christians from Asia Minor to Africa continued to attend synagogue services and observe Jewish high holidays.” The article went on to say, quoting scholar Paula Fredriksen: “Fourth-century gentile Christians, despite the anti-Jewish ideology of their own bishops, kept Saturdays as their day of rest, accepted gifts of matzo from Jewish friends at Passover, indeed still celebrated Easter according to when Jews kept Passover.” Does this example have any relation to the first-century New Testament church at Antioch and its practices? JG In the church at Antioch—and for that matter in much if not all the gentile world in the earliest days of Christianity—the celebration of the Jewish festivals and of the Sabbath was a given. There was no attempt to break away from these historical and biblical practices of the church in its earliest days, because the earliest believers merely continued to be a part of the Jewish community. It’s very interesting that Paul even encouraged, if not enjoined, the observance of Passover upon gentile Christians in 1 Corinthians 5:7 when he said, “Because Christ, our Passover, has been sacrificed for us, therefore let us keep the feast . . . with the unleavened bread of sincerity and truth.” He was specifically talking about the Festival of Unleavened Bread, of which the Passover was a part. So the church continued to observe this festival: I don’t think there is any question about the observance of Passover in the days of Paul and on into the beginning of the second century. Only as the church began to have influence in the Western world, the Latin area, did it begin to emphasize having less relationship with the Jews. 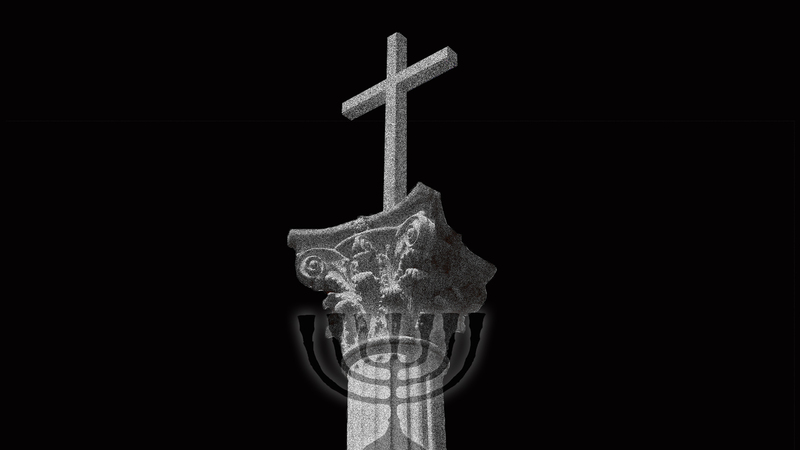 The conflict continued to grow to the point where the Western church wanted to be relieved of any connection whatsoever with the Jewish people. That’s why there was an effort to change the timing of the celebration of the death, burial and resurrection of Jesus, so that it was not connected to the Jewish calendar. Of course, that was ultimately realized in 325 when Constantine, almost by imperial edict, stated in one of his letters, “Let us have nothing more in common with these pitiful Jews, who are the murderers and parricides of our Lord. Therefore, this irregularity [Passover observance] must be corrected.” It was at this time that the pivotal event of history, the foundation of Christian faith, was wrenched from its Jewish context. DH Luke writes that Paul returned to the Roman colony of Philippi in Macedonia on one of his journeys, and that they “sailed away from Philippi after the Days of Unleavened Bread.” Some scholars would say that Luke is simply using the biblical festival as a time marker. What is your perception? JG Paul would have been keeping the Passover and the Days of Unleavened Bread, first of all with those who were a part of his own Jewish community, his own Jewish family. But he would also have been observing the Passover with those who were believers in Jesus from the gentile world. Paul’s thinking was that these people who were in times past pagans, which the term gentile came to connote, had become part of “the commonwealth of Israel” by being adopted into God’s family tree through their faith in Jesus as the Messiah. DH To go back to the news magazine article, it goes on to say that the divide between Judaism and Christianity resulted from politics within the Roman Empire and Constantine’s decision in favor of Christianity. It notes that under Emperor Constantine the Sabbath was changed to Sunday and that Christians were told not to confer with rabbis about the dating of Easter (or, more accurately, Passover). From what we know of Paul, how might he have reacted to that situation if he had been alive? JG I think Paul would have reacted somewhat negatively, probably very negatively, to the idea of compromising fundamental truth of Holy Scripture to accommodate the political powers that be. Even though Paul was pretty much an accommodating, flexible person, I think he had some theological nonnegotiables. And in my view he would not have been a party to this kind of an effort to do away with things that were obviously divine in origin and replace them with things that were obviously human in origin. DH Peter Tomson, who wrote Paul and the Jewish Law back in 1990, says that “an adequate reading of Paul requires a correct approach of ancient Judaism; and both presuppose a reflected distance towards Christian tradition.” He says, “This desideratum requires nothing less than a paradigmatic shift in the basic perceptions, aims and methods of established Christian scholarship.” This is talking about overturning the entire theological apple cart. JG Oh, I would agree. I think we are very much faced with a need, if not a demand, to reevaluate the foundations of Christian faith, because Christianity has become so Hellenized and so Latinized over the centuries that, unfortunately, a lot of Christian faith is more rooted in Greek philosophers than in the thinking of Hebrew prophets and apostles. So we are in the process of a paradigm shift. But I think it’s going to be even greater and probably more massive than we’ve ever imagined. The problem is that Christianity, as we know it today, is the result of a conscious effort—beginning in the second, third, and fourth centuries and continuing on to the present time—to blend Hebraic thought with neo-Platonic philosophy. The two simply don’t mix. They don’t have the same worldview; they don’t have the same mindset. They are diametrically opposed to one another. So it’s a real problem, philosophically, to try to mesh the two. We know that some of the Greek fathers, particularly Origen and Tertullian, attempted to syncretize Hebraic and Platonic thought. Thomas Aquinas later tried to mesh Hebraic thought with Aristotelian philosophy. It simply doesn’t work. This is the problem we have now: we must review our Christian faith and our Christian practices to see which ones are rooted in the Hebraic mindset and worldview. If we do, we are going to find the things that are rooted in the thinking of Jesus and the apostles—all of whom were Jews. DH Your analysis surely brings people face-to-face with the need to make great changes sooner or later. That is why I think it is so important to come to this fundamental understanding of the unchangeable nature of God—that immutability is part of His character. God never changes. And if Hebrews 13: 8 is accurate and “Jesus Christ is the same yesterday, today, and forever,” then the Jesus who lived in the first century is the same Jesus who gave the understanding of the Torah to ancient Israel, and He will be the same forever. When we come to an understanding of the fundamental immutable nature of God, we can expect His dealings with humankind to have continuity. Then we realize that God didn’t start a religion, operate and confirm it for 1,500 years, and then suddenly decide, “This is simply not working; we need to do away with this religion and try something else.” That idea suggests that God is forever trying new things, hoping He will find something that will work. If God tried Judaism and finally gave up on it, saying, “This is just not working,” then what gives us any reason to believe that Christianity is going to work? God is the same. He is consistent. DH What do you think needs to happen within traditional Christian belief, then, to bring it back to where it began? JG Well, it’s a big project. First of all, we have to go back and rethink our Christian doctrines and practices. Obviously, everything we do is founded on something we believe in Christianity, so we need to rethink the beliefs and find out what was and is rooted in the Hebraic foundations of the faith. We start, I think, by acknowledging that the Bible of Jesus and the apostles was what we call the Old Testament. The term Old Testament has come to be somewhat pejorative, as though it is dead and has very little meaning. Some denominations will even go so far as to say that. But in reality the Bible of Jesus and the apostles was the Old Testament. When Paul said that all Scripture is God-breathed and is profitable for teaching and instruction in righteousness so that the man or woman of God may be complete or mature, and completely equipped unto every good work, he was talking about the words that are recorded from Genesis to Malachi. The Gospels hadn’t yet been written, and the Pauline epistles were only then in the process of being written. We have to go back and get a new appreciation for the Bible of Jesus and the apostles, because this is foundational to our faith. We have to realize once and for all that the faith of Jesus and the apostles was a Hebraic faith, solidly rooted in the Hebrew Scriptures. Then we have to begin to sort out what we are doing and what we believe in Christianity that is founded on the Book. If it is not, then we need to rethink, reevaluate and reform. And we need to reform by restoring. We must go back to the Book—a true back-to-the-Bible movement, if you please—read it for what it says, and explicate it for what it says. Only then can we discover what we are doing that is not based there and change accordingly. I’m certain we will discover that every authentic expression of Christian faith has a Jewish root.